There is plenty of room on this one-and-only livable planet for all cultures to co-exist on a basis of equality, mutual respect, fair-play, self-determination, and non-interference. It has to be that, or nothing. The notion of a Christian commonwealth should be exploded forever. … Government should protect every man in thinking and speaking freely, and see that one does not abuse another. The liberty I contend for is more than toleration. The very idea of toleration is despicable; it supposes that some have a pre-eminence above the rest to grant indulgence, whereas all should be equally free, Jews, Turks, Pagans and Christians. 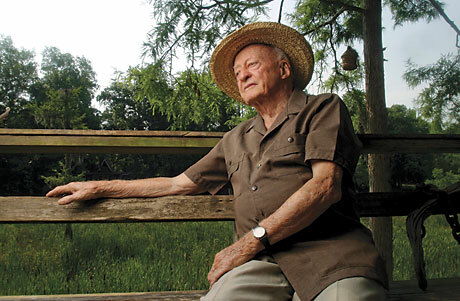 Stetson Kennedy was an author, folklorist, environmentalist, labor activist, and human rights advocate. He was also known for his infiltration of the Ku Klux Klan during the 1940s. Kennedy authored eight books, including Palmetto Country, Southern Exposure, and The Klan Unmasked. In Kennedy’s early years, he became one of the country’s pioneering folklorists. As a teenager, he began gathering white and African American folklore material while he was collecting “a dollar down and dollar a week” accounts for his father, a furniture merchant. He left the University of Florida in 1937 to join the WPA Florida Writers’ Project, and at the age of 21, was put in charge of folklore, oral history, and ethnic studies. While he was with the WPA, he oversaw the work of African American writer Zora Neal Hurston. After World War II, Kennedy and another informant infiltrated the Ku Klux Klan and related white supremacist groups, exposing their secrets, helping Georgia authorities revoke the Klan’s corporate charter, and testifying against a fascist Klan offshoot known as the Columbians. Kennedy made public such information as secret code words and details of Klan rituals, including a stint where he supplied Klan secrets to the writers of the Superman radio program, culminating in a series of four episodes in which Superman battled the KKK. The Library of Congress recently made a wealth of recordings and pictures from the project available online. Kennedy has been called “one of the pioneer folklore collectors during the first half of the 20th century,” and his work is a keystone of the library’s presentation. The project eventually documented folktales, life histories, superstitions and the religious and secular music of African-American, Arabic, Bahamian, British-American, Cuban, Greek, Italian, Minorcan, Seminole and Slavic communities throughout Florida. In 1964, Mr. Kennedy went to work for the federal anti-poverty agency in Jacksonville. Yates, who headed the agency from 1968-1972, said Mr. Kennedy played a key role in getting the agency funded initially and then wrote many of the grant applications that kept it going. He remained with the agency until 1979, when, after feuding with his boss, he was fired. Baptist minister John Leland played a key role in the struggle for religious liberty in both Virginia and Connecticut. Raised in New England, Leland traveled to Virginia in 1775 to spread the Baptist message just as tensions between the established Anglican Church and the Baptists were mounting. Leland’s experience witnessing the persecution and imprisonment of his fellow Baptist preachers — in addition to being threatened with a gun himself — hardened his view that church and state must be separate for individuals to be free to follow their conscience in matters of religion. “Every man must give an account of himself to God, and therefore every man ought to be at liberty to serve God in a way that he can best reconcile to his conscience. If government can answer for individuals at the day of judgment, let men be controlled by it in religious matters; otherwise, let men be free,” he wrote. Demanding freedom of religion, Leland became a key player in the so-called Virginia experience, where he found strong allies in James Madison and Thomas Jefferson. It was an unlikely alliance. Jefferson was skeptical of traditional Christianity; Leland was a fervent evangelical intent on spreading the “Good News” of the Gospel. Yet Leland, Madison and Jefferson shared a passionate belief in religious liberty. They found common ground for different reasons. Like the Puritan dissident Roger Williams, Leland was convinced that the church must be protected from interference and incursions of the state; he opposed any form of state support of religion. Jefferson believed that it was the state that needed protection from overzealous clergymen and organized religious groups. Leland became a pivotal supporter of James Madison and helped win Baptist support for Madison’s election to the First Congress, where Madison drafted what would become the First Amendment of the Bill of Rights. In 1791, Leland moved back to New England, where the Congregational Church still maintained its place as the established, preferred church in both Massachusetts and Connecticut. Leland fought to end religious establishment in both states and saw Connecticut end establishment in 1818 and Massachusetts in 1833. An ardent supporter of Thomas Jefferson, Leland became famous for his media-savvy strategy to signal the Baptists’ support of the newly elected president in 1801: the gift of a giant wheel of cheese. Reportedly made from the milk of 900 Republican cows, the cheese measured 4 feet in diameter, 13 feet in circumference, and weighed 1,235 pounds. Emblazoned on its red crust was Jefferson’s favorite motto: “Rebellion to tyrants is obedience to God.” As the giant cheese made the monthlong journey from western Massachusetts to Washington, D. C., pundits lampooned, ridiculed and celebrated the “mammoth cheese.” On Jan. 1, 1802, Jefferson welcomed Leland and his flamboyant gift into White House. Two days later, Leland delivered the Sunday sermon in the House of Representatives, with the president in attendance.